Safe and effective anti-diarrheal for your dog. Dr. Harvey’s Runs Be Done is an all-natural, safe and effective anti-diarrheal for your dog. The potent, yet soothing blend of pumpkin, slippery elm, apple, pectin, bentonite clay, and other healing herbs rapidly target loose stools and diarrhea, while promoting regularity and healthy digestion. 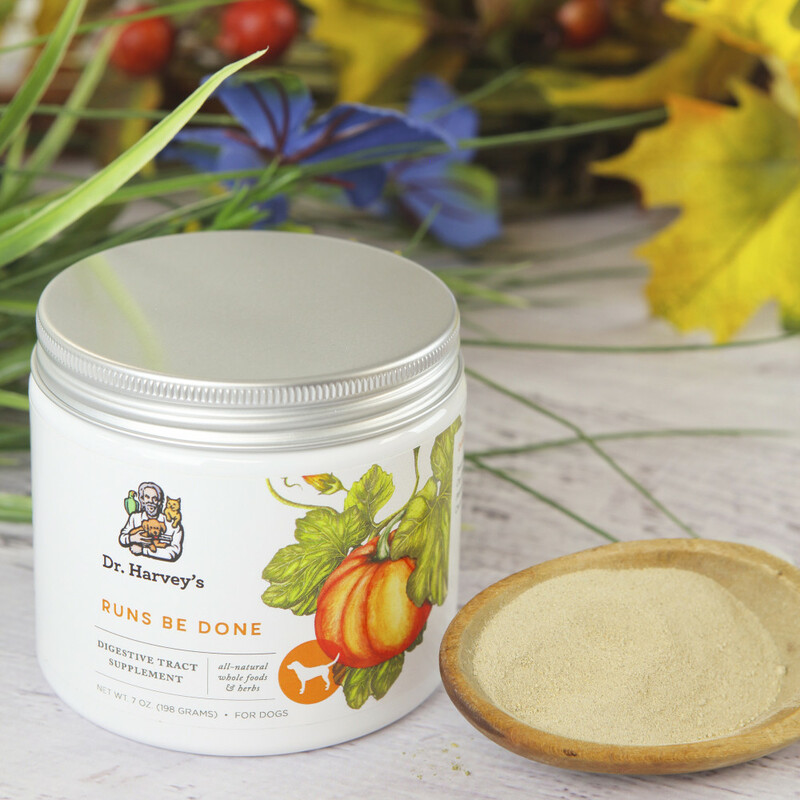 And unlike canned pumpkin that goes to waste in the fridge, Runs Be Done comes in a convenient powder – simply use it as needed and store the rest! 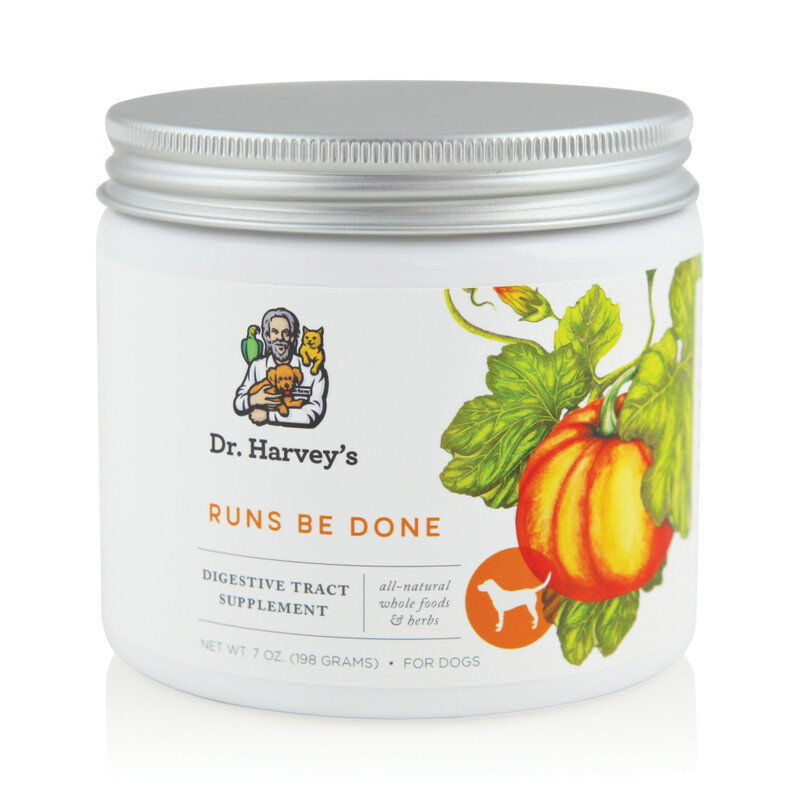 Trusted by thousands of pet parents like you, Runs Be Done is the perfect addition to your dog’s “health toolkit”. Simply keep it on-hand, use it as needed, and store the rest for later. Enjoy the essential peace of mind that you want – and provide the wellness support that your best friend needs. This container holds approximately 94 scoops. 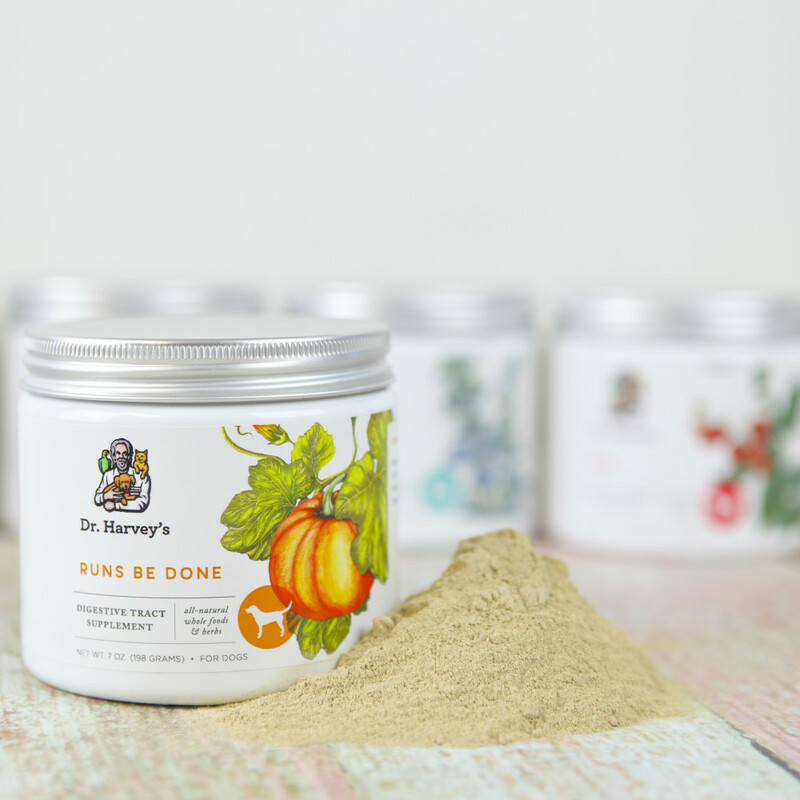 Each scoop is approximately 2100 mg.
At Dr. Harvey’s, we’re dedicated to maintaining the highest standards of food safety and nutritional integrity – which is why you won’t find any preservatives, dyes, or artificial ingredients of any kind in Runs Be Done. To learn more about our commitment to natural, safe and 100% chemical-free ingredients and products, click here. We proudly stand behind Runs Be Done and believe that it’s the best natural anti-diarrheal your dog. If for any reason you (or your beloved companion!) aren’t satisfied, let us know and we’ll refund your money. If you have additional questions regarding Runs Be Done or need some suggestions for how to help your dog that won’t eat, contact Dr. Harvey today. Dr. Harvey is a wealth of information, a teacher and lecturer, he is always happy to respond to your questions or comments concerning your companion animals. If you do not find the answer to your questions on our website, please contact us directly in any one of the ways listed below. We read and respond personally to all email.